As I was picking meat for the week at the Park Slope Food Coop, the “Wild Boar Mini Roast, Distributed by d‘Artagnan” looked like the perfect piece for Pierre and I to make into one of our celebration dinner sfor our 21st anniversary month —neither of us remembers the exact date, so that’s a good excuse to have a few celebration throughout the month of January. The D’Artagnan Wild Boar Mini-Roast is made from the knuckle and is pre-tied to hold its shape and allow for even cooking temperature. Simply brown in a hot sauté pan with sliced garlic and rosemary to seal. Then place in the oven about 375F to finish the cooking or until internal temperature reaches 155-160F. 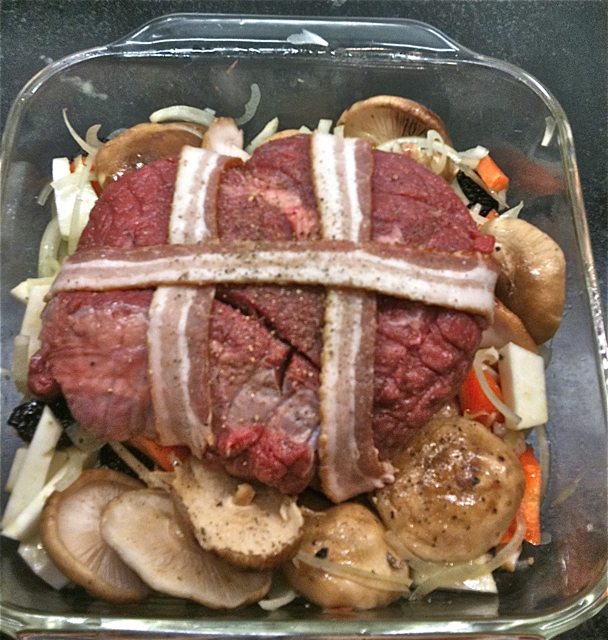 Remove from oven and let rest before slicing. Serve either hot or cold. Great on sandwiches! 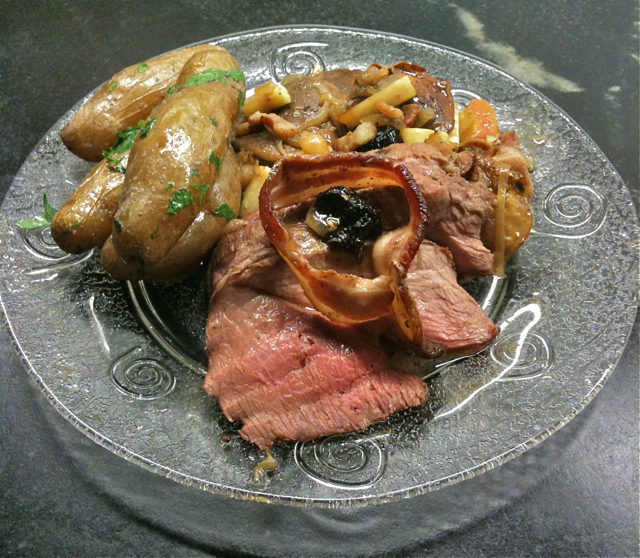 D’Artagnan Wild Boar come from a large free-range ranch outside of Quebec. The animals graze freely on nuts, acorns, and grasses while being supported at times of need by whole grains. You’ll find the meat leaner than large-farm pork and richer in taste, but smooth and succulent in texture. 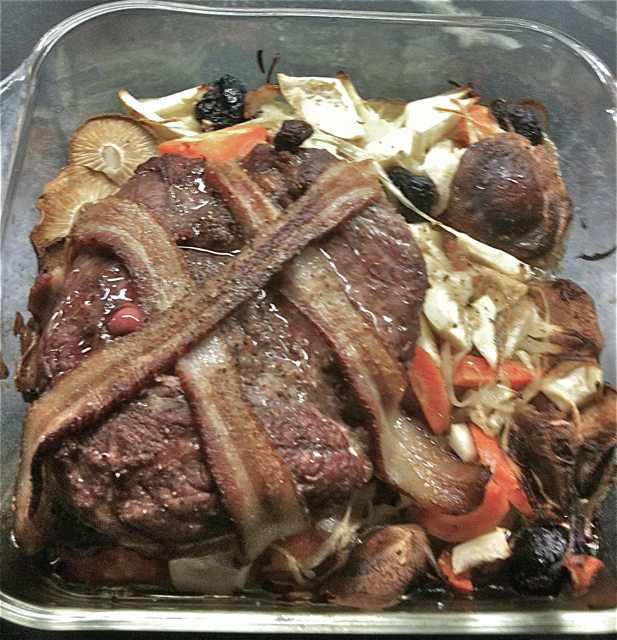 Take one sliced onion, 1 cup of sliced celery root, 1 sliced carrot, 6 slices of chopped bacon, one cup of unsweetened cherries and about a dozen heads of shitake mushrooms, and place it all in a roasting dish. Generously coat if with olive oil, add salt pepper. Mix well. Coat the meat with oil, salt pepper. Wrap with uncured apple wood smoked bacon. Place roast on top of the veggies and that’s how it goes into the oven. As we read above, the legit internal cooking temperature is 155-160F, but that is too much for me. Our roast was 1.31lb, I cooked it for 40mn, the temperature reached 144F and this was a little over cooked for us, but that is a matter of taste and choice. In the same oven cook fingerling potatoes in another roasting pan, lightly coated with oil and seasoned with salt and pepper. Once the meat is cooked to your liking, let it rest and transfer the vegetables & cooking juices into a sauté pan with one tablespoon of melted butter and a dash of oil. Sauté the veggies and flambé with Armagnac. Finish up the fingerlings potatoes with fresh butter and parsley. Slice the meat, keep it warm, pour the juice into the veggie pan, add another dollop of butter in the pan to give it a shine! Set up you plate and serve quickly. Really simple, delicious and if you are a Park Slope Food Coop member, not expensive either ($10.10 for the roast, a little more if you order at d’Artagnan but you don’t have to work for the discounted price and it can be delivered to your house!). Though very tasty with a rich and lightly gamy taste, I have to confess that the meat was a little tough, the marinade would have certainly ‘cured’ the problem, but other than that it was amazing. 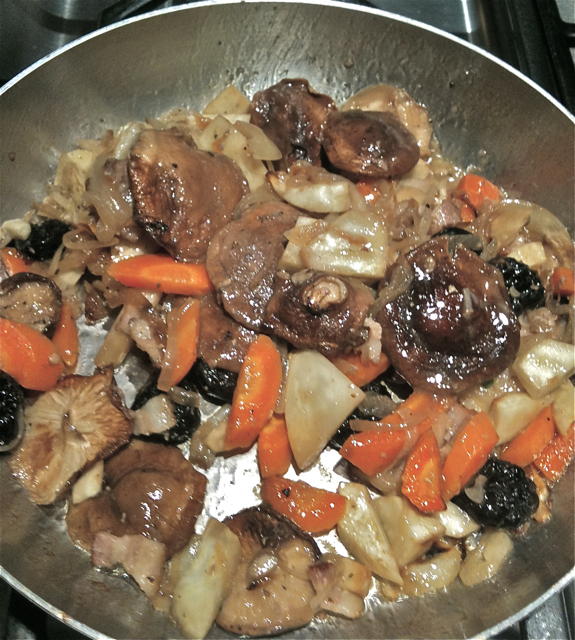 The hints of tartness (unsweetened dry cherries) combined with the distinguished taste of celery root, the shitake mushrooms’ texture, the sweetness of the carrots & onions, the mildly wild taste of the boar and the hint of Armagnac, plus the bottle of the inexpensive, but good Côte du Rhône Les Garrigues to wash it down, made it a very pleasing experience indeed. It took me only 15/20 minutes to prepare it, 40 minute to roast it, and 10 minutes to finish it up. We had a few slices left over that will make a great sandwich for lunch. Enjoy le sanglier! Mmmmmmh…. I can smell it from here ! Of course, I do not remember the date either and I am usually good at such things. I will do my best to turn what remains of the month into a celebration of sorts. Happy Anniversary ! You are both very lucky to have found each other, deserving too ! Bon Matin or apres midi or nuit, I suppose. I have been half expecting a treatise on French Waterproofing. How about something called, ‘Sur Les Fuites’? Throw in a few recipes and voila, an instant coffee table success! Just a thought.